This paper examines the current account as a signal of economic imbalances in the economy. Specifically, we examine if real-time estimates of the current account give similar signals to revised estimates. Real-time estimates refer to the vintage of data which is available closest to a given moment in time. Statistical agencies release a first estimate of series such as the current account. These estimates are then later revised as more information becomes available to the statistical agency. These later estimates are referred to as “revised” or “final” estimates. Why are real-time estimates useful? When assessing the current state of the economy, policymakers or forecasters will typically rely heavily on the real-time data that is available to them. Revised final vintages will only become available much later on. With this in mind, real-time estimates can be much more important than those of the revised estimates when examining if a variable is useful as an early warning signal of economic imbalances. Looking at a range of OECD countries, we find that the scale of revisions to the current account are quite large (typically over 1 per cent of GDP). In addition, the revisions in some countries appear to be somewhat predictable. Looking at the trajectory of the current account, we find that when large changes to the current account balance occur, they tend to be larger in the revised vintages of data, compared to the real-time estimates. This implies that important changes in the current account, which could signal a build-up of imbalances, may not initially be apparent in the real-time data. Looking specifically at Ireland, we find that current account revisions tend to be amongst the highest in the OECD. 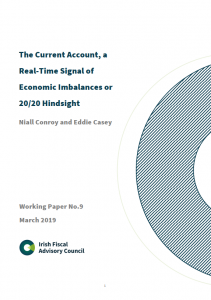 In addition, the real-time current account balance in Ireland did not signal the same degree of imbalances in the run up to the recent crisis, compared with the revised estimates that are now available. The opinions expressed and arguments employed in this paper do not necessarily reflect the official views of IFAC.